My Favourite from this month is this selfie from the 2 hour virgin train journey to visit my parents. Keeping a baby entertained on a train can be tricky and so we found fun with stickers passed the time. Love this as we were having so much fun sticking them to ourselves. 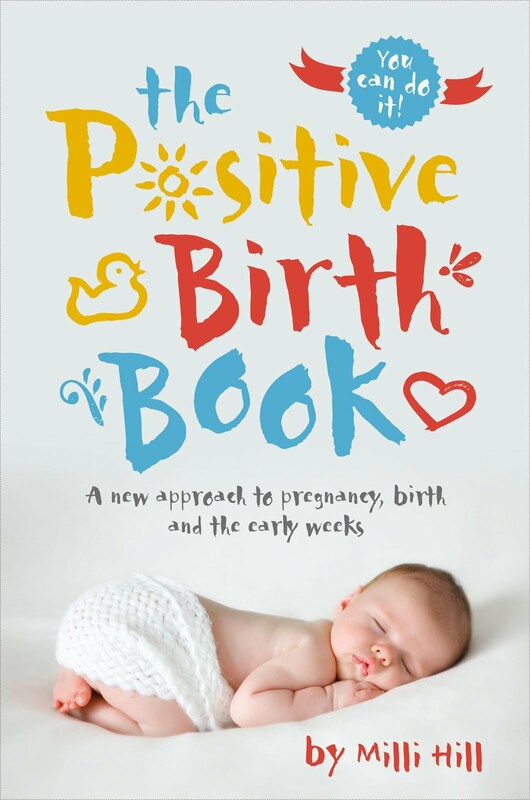 I was delighted to be contacted to review the book The Stork and My Given Name by Kevin Tyler. I had seen these personalised books on social media and always thought they looked great. I really love personalised books as I think they help a child gain an identity which is exactly what Kevin set out to do with this book. The book is a beautiful hardbound book that has a really attractive front cover on it. I think the colouring chosen for it and the illustrations on it and the way the title is placed out on the front really makes it stand out as a good quality, fun exciting book to want to read. The pages inside the book are all illustrated with such detail and the characters all look great with plenty of expression and happy faces. Lily was very pleased with how colourful the book was and really enjoyed looking at the pages. 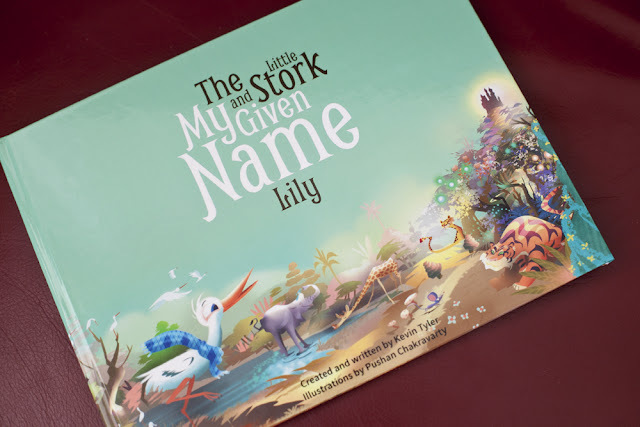 When organising the personalisation of the book I got asked for the name I wanted which was of course Lily. If I wanted male or female and also hair colour and skin colour. This was to make up the character in the book that would be Lily. Lily doesn't appear until the end of the book, but when she does it is a really cute little baby image and I can imagine that it is lily. The story itself is lovely. I really love the fact that it has a stork in it. I love the idea of it being a stork that brings the baby home to the mother. Its such a classic story and you don't see it as much as you used to. The story starts with a very personal note with the stork saying hello to your child and introducing itself and then goes on to have a magical adventure to collect the child and bring it home. Along the way it meets some creatures. 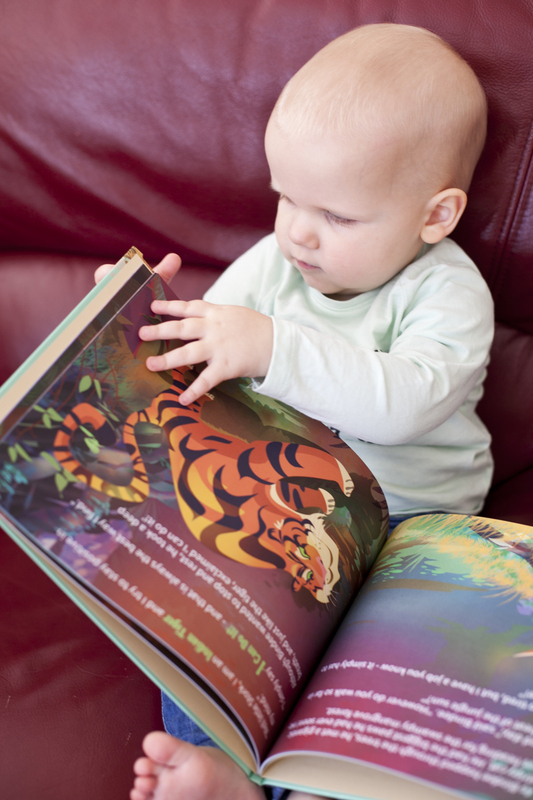 The book is really clever and the creatures start with the Letters in the name, for example L for Lion. It also has a word for the Letter so we have Loveable for L. The words that are used are really lovely positive words for children to hear. These letters play an important part in the story and at the end of the story provide you with a really beautiful personalised ending. I really like the book and especially the ending. Lily is a little young to understand the story yet though I will still read it her. 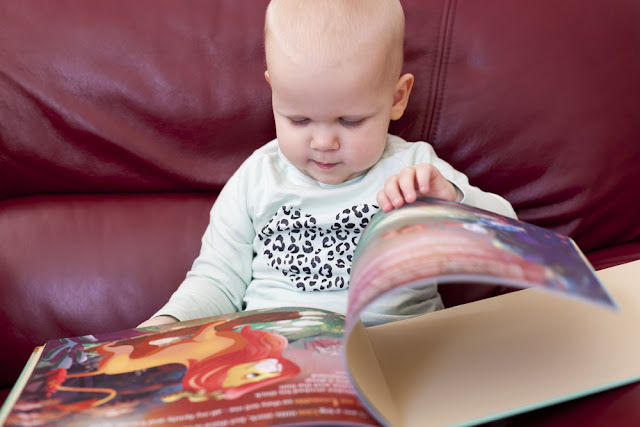 But its going to be so nice for her to own this book when she is older. I remember when I was a child that I had a personalised story and it was very special to me and I loved the fact and thought it was amazing that my name was in a book and the book was all about me. The book can be bought at www.mygivenname.com for either £19.95 or £23.90. 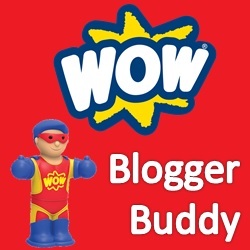 Now you have the chance to win your child a copy! 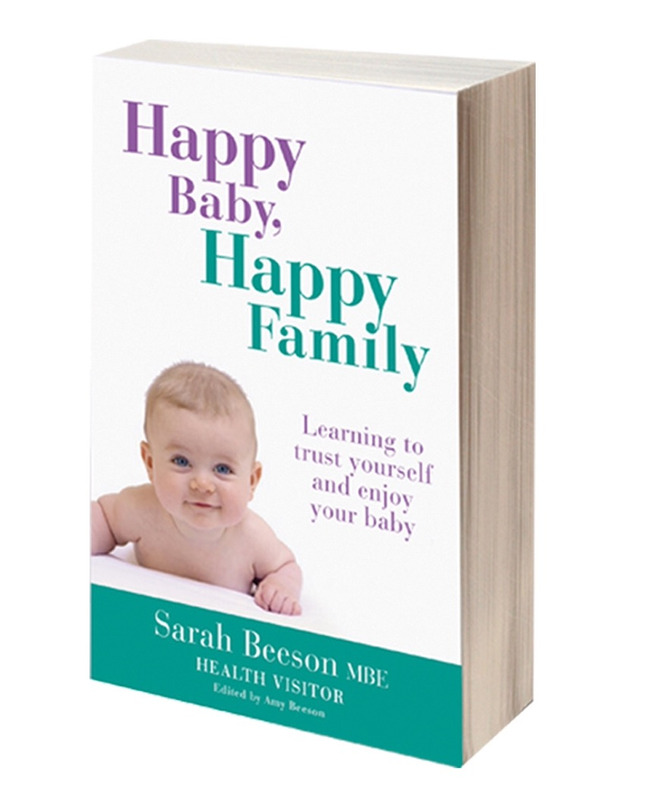 My Given name is offering one hardbound book worth £23.90 to one lucky winner. They have also made a video that highlights what's so special about My Given name and you can get yourself extra points if you watch it. Its a short but lovely video and well worth the watch. Enter Below on the Gleam app. 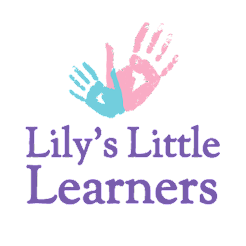 Last year Lily would have been 4 and a half months old and wouldn't of understood what was happening. She wasn't eating chocolate last year and so received bunny teddy's instead. In fact it was this time last year we bought her beloved bunny that she has to sleep with every night. It really is crazy to think she has cuddled that for a whole year now. 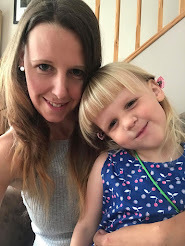 This year I really wanted to do some arts and crafts with Lily but as the week before I was at my mums house we had only 3 days before we went to my partners mums to spend Easter there. 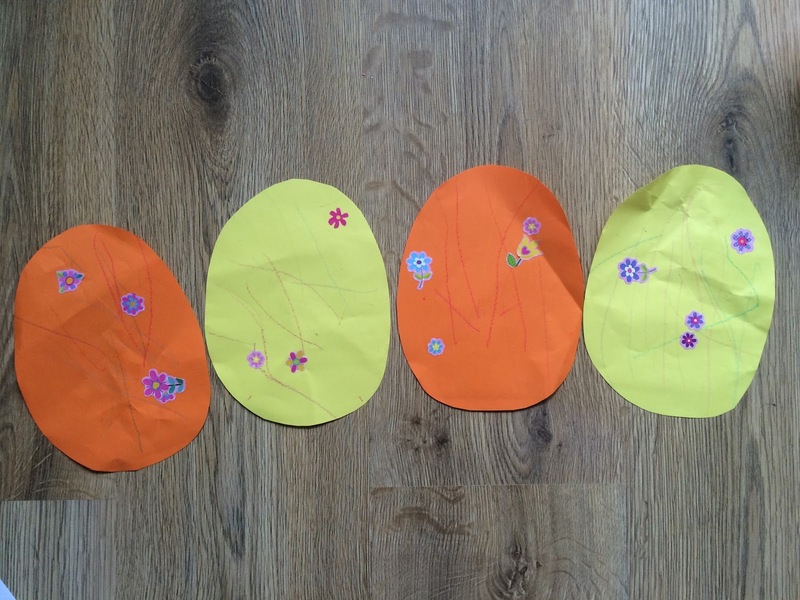 Lily isn't the biggest fan of painting yet and so I thought that a nice simple Easter activity would be to decorate egg shapes. Colouring and sticking is one of lily's favourite things to do so keeping it simple was the best for Lily. Here are the 4 eggs that she decorated. Easter weekend itself was at my partners mums house. Its always nice visiting as we also get to see Lily's cousins. This year we got Lily her first Easter egg which we gave to her on good Friday to save taking it with us. She is to young to understand the Easter bunny yet so I don't think that it really matters at the moment that she didn't receive it on Easter. We got her a Milky Bar one as she does love her white chocolate. Easter morning Chris's mum gave her the cutest Easter egg. It was a Hello Kitty Egg. Lily was delighted with it and spent the rest of the day carrying it around in the box. We did have plans for later in the day to head to a outdoor Easter egg hunt which was unfortunately stopped because of the bad weather. So instead we decided to run to the local shop and buy a few eggs and hide them around the house. We had to guide Lily around but she loved collecting the eggs and putting them into her bag. Lily collected up 6 eggs and then decided to organise them onto the table. Another one of her favourite things to do. So all in all Lily had a great Easter. So far I haven't given her a lot of the chocolate. She has eaten one gold bear and a few chocolate coins she got. I'm not a mummy that worries to much about chocolate but at the same time she is only 16 months old and I don't want her having to much of it. I think a little bit as a treat here and there is enough and also means all the chocolate she has will last her quite a while. How about everyone else? Did you have a good Easter? How much chocolate did your little ones get? Haven't posted as many blog posts this week as was visiting my mum and dads up north until Thursday. Lily loves seeing my mum and dad and when my dad picked us up at the station she recognised him straight away and reached out her arms to go to him. I always worry that spending months away from them will make her forget but she doesn't which is great. We had a great week visiting loads of members of the family and we had some great days out. 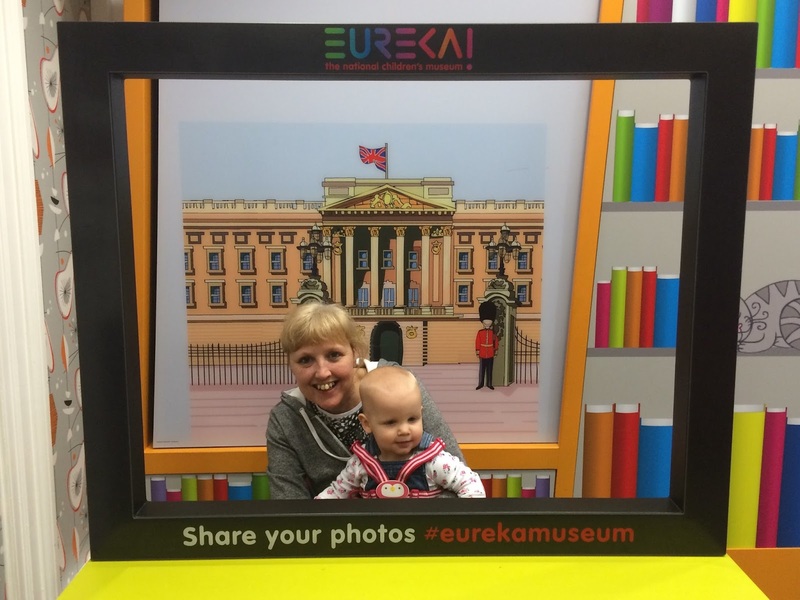 Our first day out was to Eureka Science museum. Lily Loved it. You can read about the full day here but I want to post this really good photograph I got of my mum and Lily. Lily has a really good bond with my mum. Some days she even wants my mum over me which she never does with anyone else. I think it helps that my mum was there when she was born and also that she takes her every morning when we stay and lets me have a lay in! Thank you mum!!! Lily also has a good relationship with my dad. She was really happy to see him when he came home from work and happily sits with him and plays and reads. On the Sunday we went out for a drive to St Annes. Was so nice to just jump in the car and be off out. Me and my partner don't drive and so find going out for the day tricky. We took Lily to the park and went to a cafe for a cup of tea, and had a nice stroll along the front. Then headed to the pier that has loads of rides for Lily to play on. She does make the cutest ice cream lady. After the nice day at St Annes we went out for tea. We headed to a carvery so then I could put a plate of food up for lily that I know she will eat. She does love her gammon and veg and mash potato. After we had eaten Lily decided that the table needed a clean, she was using her drinks bottle to put down water and then was cleaning up with a tissue. At one point the waiter came over and took her tissue and she wasn't happy, you should of seen her face, she gave him the dirtiest look. 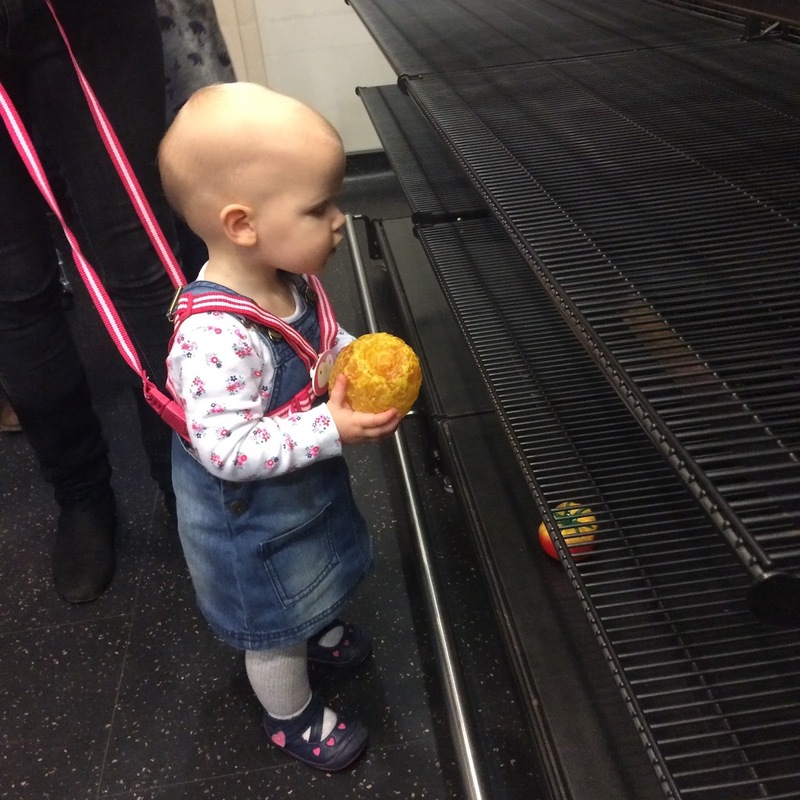 This trip was the first trip that Lily really enjoyed seeing my mums Guinea Pigs. She had to go in every day to see them and help feed them. My mum has 3 of them, and one is blind. On the last day Lily reached out and stroked the blind one on the nose. Guinea pigs make really good pets for children. We are always sad to leave but Mum and dad are coming to visit me in a few weeks and we just cant wait. Hope everyone else had a nice week. With it being British Science Week this week its only natural that we took a trip to visit one of my favourite children's museums, Eureka! Eureka is in Halifax in Yorkshire and so it worked out perfect that I am up north visiting my parents in Lancashire. Its only an hours drive away from here. Eureka has been one of my favourite museums since I was a child. I remember taking a school trip there and visiting it with my parents. It was so exciting taking my own child there for the first time. Today we went with my mum and my cousin and her little boy who is 2. 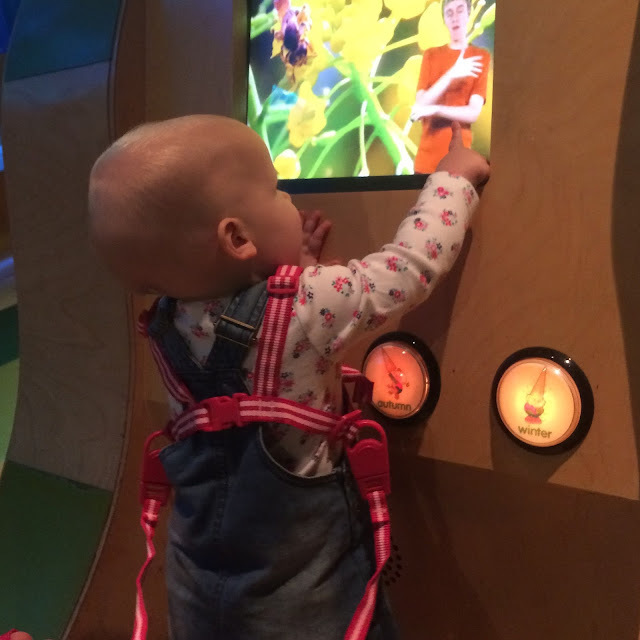 Lily is quite young at 16 months for a lot of the things at the museum but I knew she would still enjoy herself and want to press every button she could find. One of the things I always remember as a child from Eureka is the man who has a bath that is in the entrance. He drops every half an hour and creates a big splash. We made sure we saw him get dunked into the water. The first part we headed to was the huge living and working together area. This is practically a huge role play area. It has a house with all the rooms a home would have in it. There is also a garage, a supermarket, a bank and a post office. 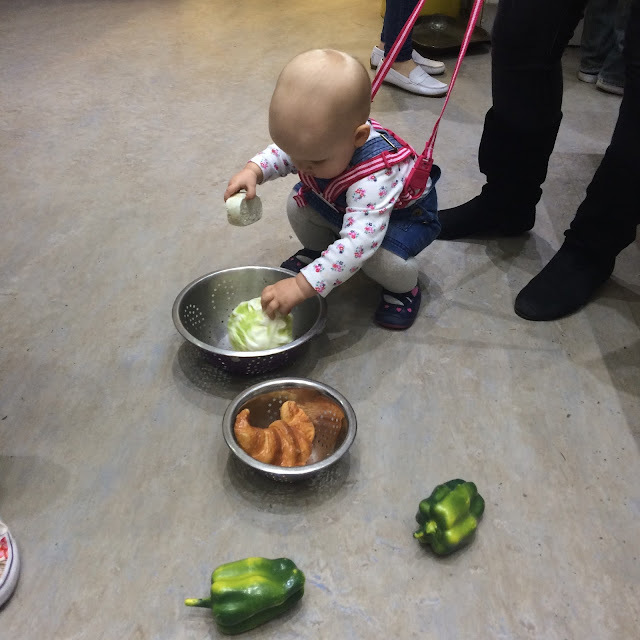 Lily really enjoyed the kitchen area. She sorted out the vegetables and did the washing, and comically used a cucumber as a telephone and walked around with it to her ear shouting "Hiya". We spent quite a while at the living section but then headed to the some of the interactive areas. There was the Desert Discovery and the Global Garden and the Sound Garden. This is where Lily got to press lots of buttons and play on computers and look at bright coloured Tv screens which she really enjoyed. There was also the Sound Space which had giant musical instruments to play and a room that played music. Lily had a really good bum wiggle to the tune of Flat Beat. The Sound Garden was Lily's favourite. It was an area all about things in the garden and the sounds they make. It was a great area for Lily to move around as there was lots for her to do and a softer area for her. She really loved the computer game where she could colour in a butterfly and then press a button to make it fly away. She would wave and shout bye as it flew away on the screen. There was also a giant honeycomb that you could hear the bees buzzing when you sat in it. After you are done at all these areas you go upstairs to the main science discovery floor which is the All About Me section. You are greeted by a robot named Zoom that tells you all about the section you are about to see. The robot is different to the one I saw as a child and I must admit I prefer the older one who always had this look that he was thrown together with a dust bin and bits and pieces. But Lily really loved the new robot talking and was transfixed to watching him speak but she clung to my mum as she watched him. She must have been thinking what on earth is that? The section all about me is all about your body. It has areas all about each part of your body and even as an adult its a really interesting part of the museum to learn from. It started with an area where you can measure your self and look in mirrors to see your self. It also had scales which made me quite happy to see that I'm 8 stone. Happy post pregnancy moment for me! I was happy to see that it still had the giant set of teeth which has always been there. Lily knows exactly where her teeth are so we posed by them and showed everyone where they are by pointing to them. Lily also found the tongue brilliant fun. It became a slide to her and she kept crawling up it and sliding down. Quite funny as the tongue shouts out YAK or Mmmmmmm as it is touched. We had a brilliant day and the great thing about Eureka is that you pay once for a year and can go back as many times as you like. We definitely are planning to go back when Lily is a little older and let her experience it again. I still love Eureka just as much as I did as a child and it will always hold great memories for me and I hope it will be somewhere Lily will gain many great memories to. Lily and I are a huge fan of Stickerscape who make gorgeous high quality children's stickers that are perfect for turning any child's bedroom with plain walls into something fun and exciting for them to look at. 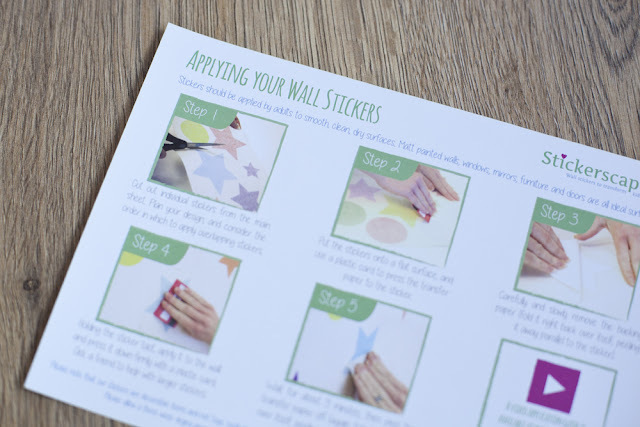 Stickerscape was founded in 2012 by Jo and Mike who are both parents to a little girl who became the inspiration behind the idea of making children's wall stickers. 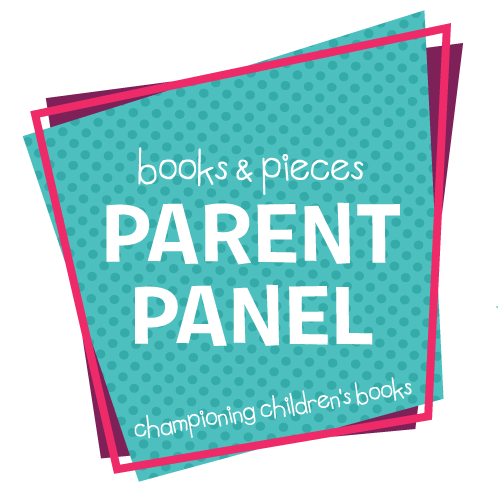 "I was excited about creating a fun, engaging place for her to grow and play in - I wanted the detail in the room to form a natural background for imaginative play and brilliant bedtime stories"
You can get these award winning stickers in many designs that suit your child's interest and can even buy personalised stickers that have your child's name on. 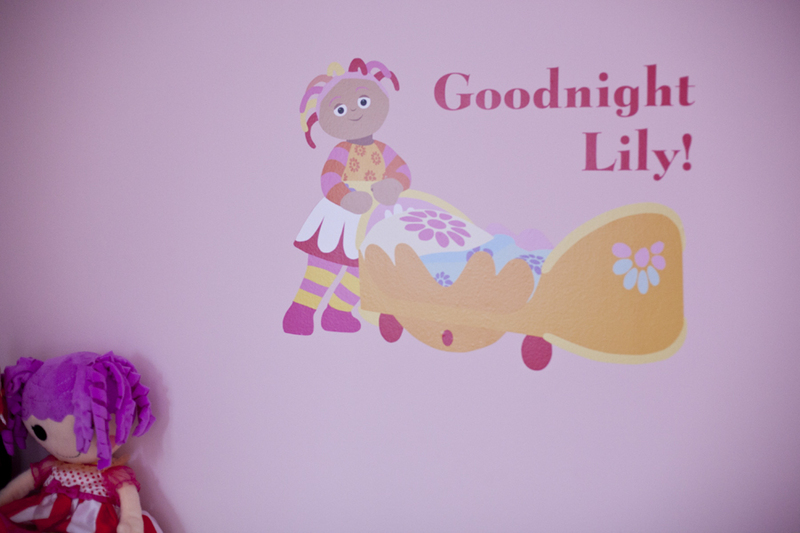 We have a In the Night Garden sticker that is personalised with Lily's name that has been on her wall for a few months now. 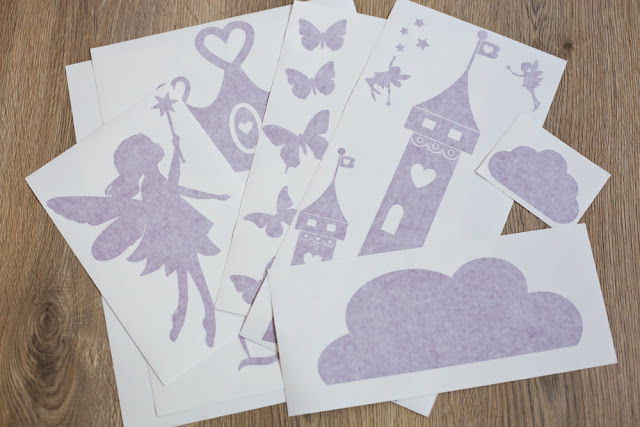 A few weeks ago we got the chance to browse the Fairy Princess Range on the website to choose some stickers for Lily's room. I chose a lovely fairy with butterflies, a castle and a crown saying Princess Lily. A week later they arrived. They came really nicely presented with a sticker closing them into the wrapping. They were all laid out ready to stick up though some had to be cut out to be placed up on the wall. They also came with instructions of how to put them up. Great for me as I wouldn't have a clue. I chose to firstly put up the Fairy with Butterflies. 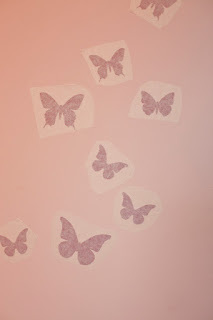 I wanted to put this above Lily's changing table so she has something to look at while laying there. My Partner was going to be doing most the work putting these stickers up. He is the one good at anything like this and more likely to do a better job. 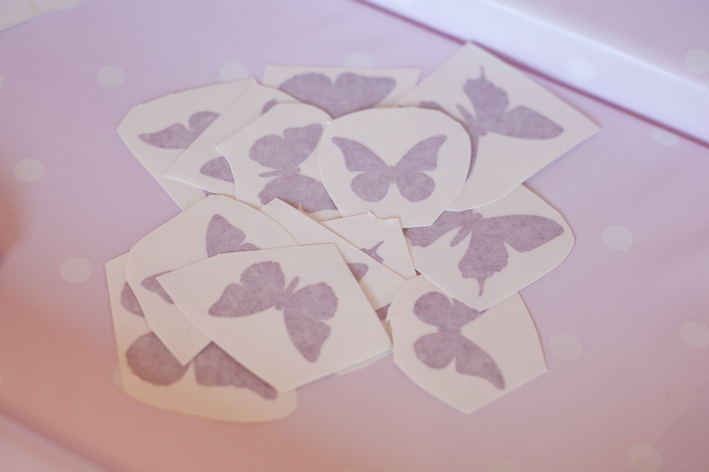 First we cut up all the butterflies. 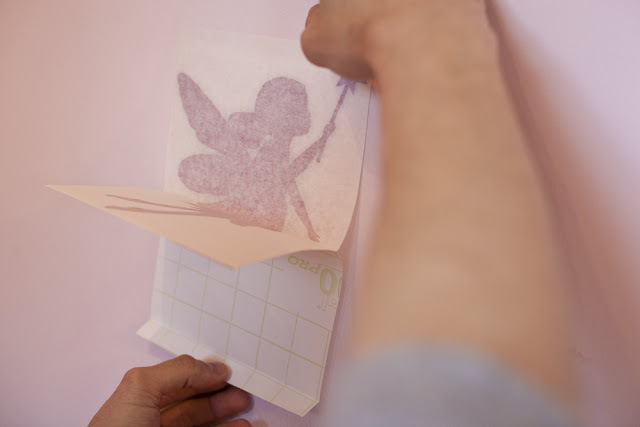 Then we laid the fairy onto the wall and pulled off the back as it was easier to do it this way. 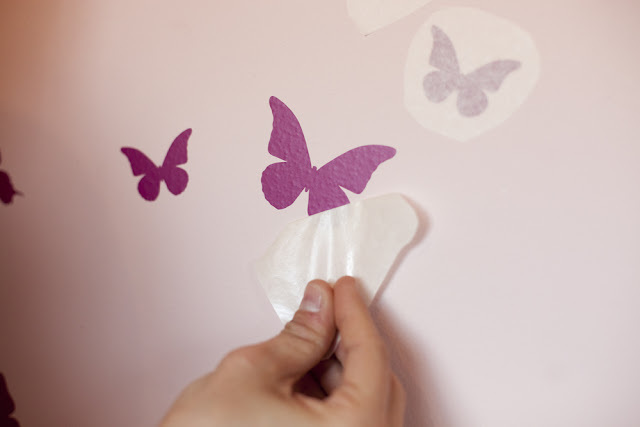 With the Butterflies it was easier to peel the back off before laying them onto the wall. 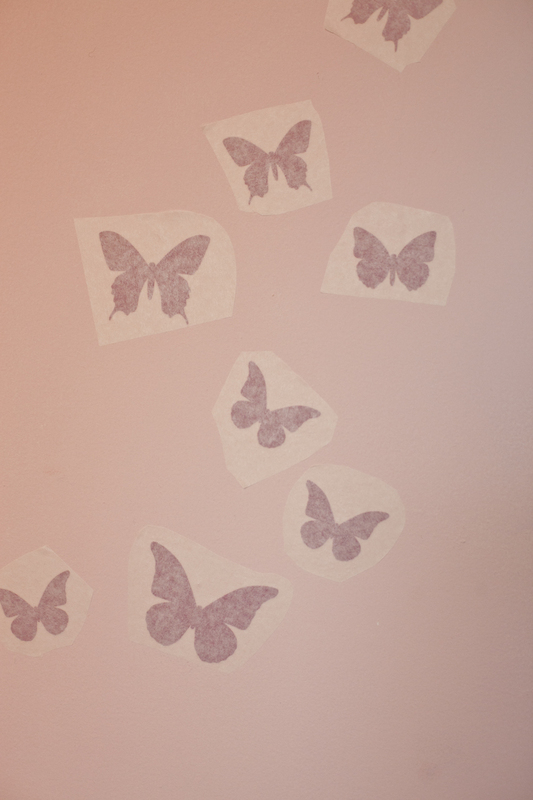 We looked at the image of how the sticker was meant to look on my phone and placed the butterflies onto the wall in the order they were meant to. After sticking them all down, we rubbed over them with a card to make sure they were stuck down. Chris did a really good job of getting them in the perfect order on the wall. It was exactly like the photograph on the website. Then we needed to peel off the front. We did this really slowly making sure the sticker had actually stuck down. They all had with no problems. After all the fronts of the stickers were pulled off I stood back and looked. It was perfect! Im really impressed with how good the stickers from Stickerscape look on our walls and will definetly be putting up the rest. The castle is to go near her book case so she can see it when we read and I'm saving the Princess Lily sign for when she is older and we do her room again. The stickers really do add a magical touch to the bedroom and its so nice for Lily to have something that makes her room more exciting. 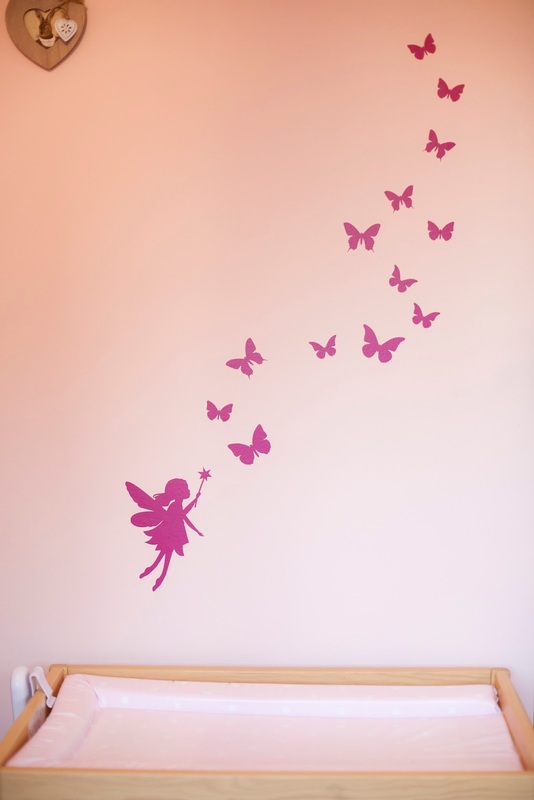 Lily Loves her wall sticker and points to the fairy and butterfly and asks me what it is with a big smile on her face. We thank Stickerscape for sending us these wonderful stickers. Stickerscape are such a nice company that they have kindly given you the chance to be able to win some stickers of your own. 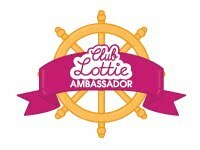 They are offering £35 to spend on any sticker you like on the website. 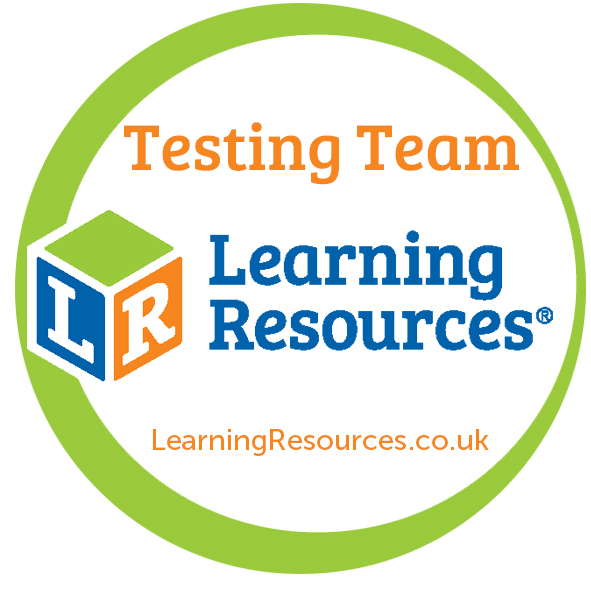 They are also kindly giving my readers a 20% discount on stickers using the code LILYSL20 at the check out. This offer will last until the 30th of April 2016. Click here to visit the Stickerscape website and claim the offer. 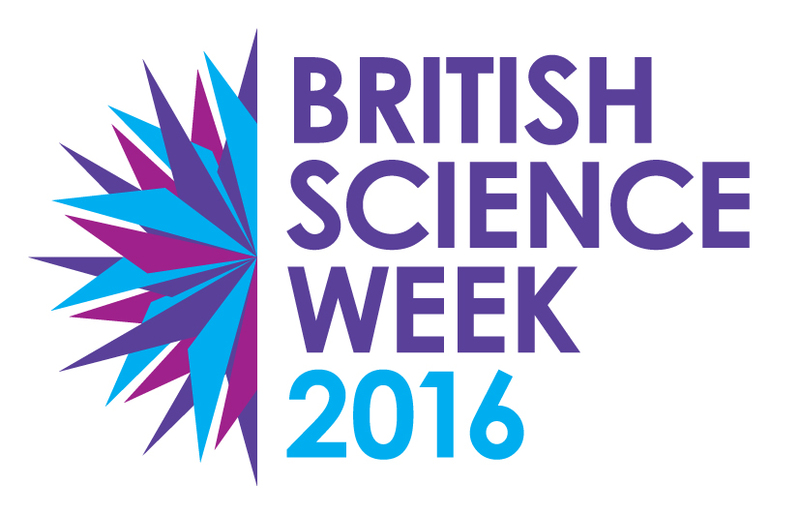 When I think of science the first images that pop into my head are images of test tubes and bunsen burners, skeletons and space. But science is actually all around us and used every day with our senses. One of the first things we learn in science is about our senses and we start to learn these from birth. Our Senses are Touch, Smell, Taste, Sound, Sight. 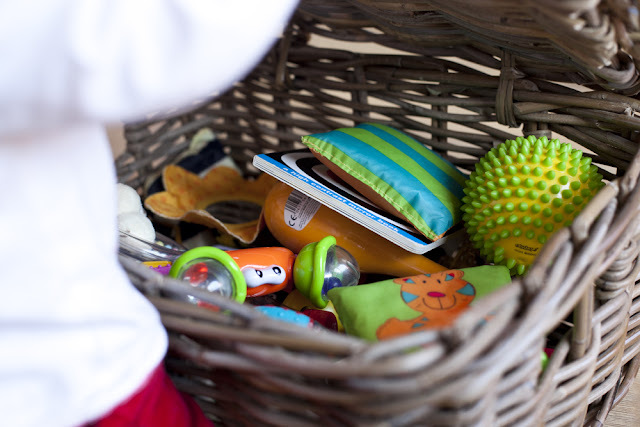 When Lily was only a few months old I started to put together a sensory basket for her. 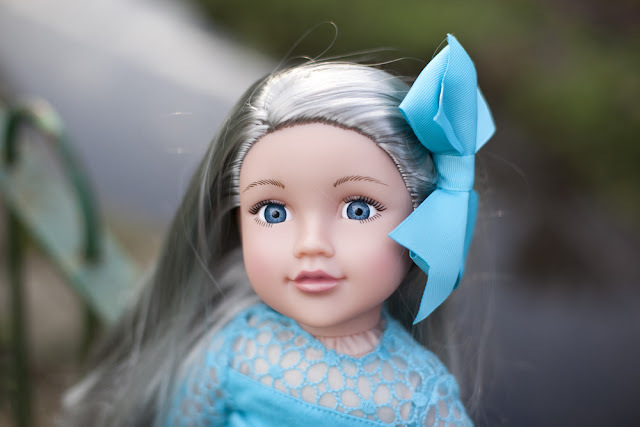 I started with a few touchy feel items and rattles and I added more and more as she got older. 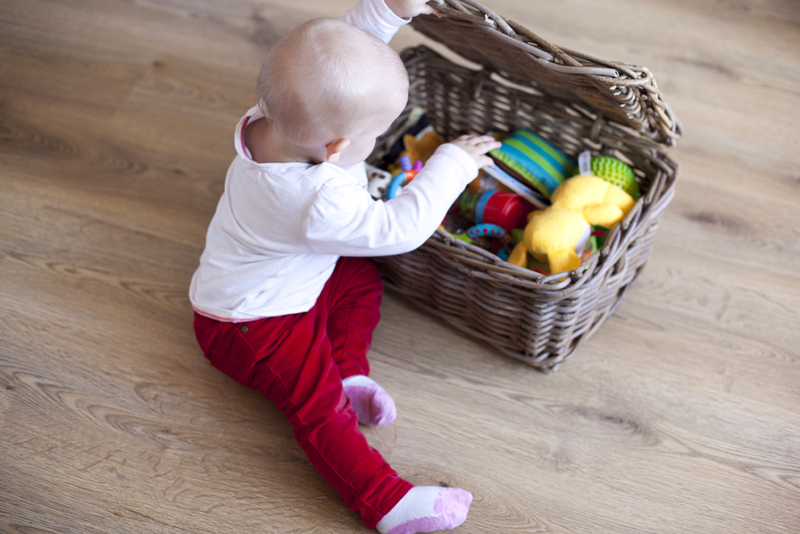 A Sensory basket is a great way for a baby to explore there senses and experience a range of exciting items that are new to them. As they get older they will understand more and more about the objects they are holding. Are they soft, hard, bright, dull, noisy or quiet. 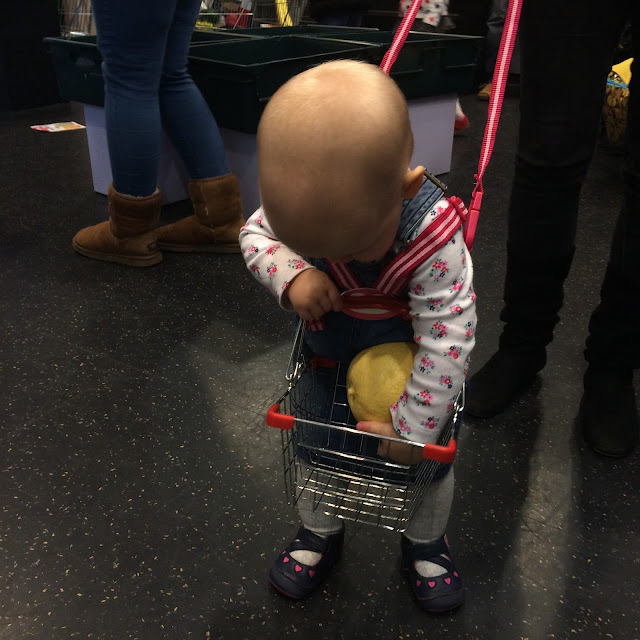 Now at nearly 16 months her sensory basket is packed full of items for her to explore. The only things we don't have in there are things for taste or smell. Ive put all her old rattles in there and her contrasty books as she no longer plays with them on a regular basis, but they work great for a occasional sound making instrument to play with when we get the basket out. So here are a just a few ideas of what you can put in your basket. A lot of items can also be used for more than once sense. For example the some of the things you can touch, like a tooth brush, can also make a great sound if rubbed against something. Some of the musical instruments may have interesting things to look at like the blue drum we have with the balls inside. Or maybe the bean bags make a noise as you scrunch them. 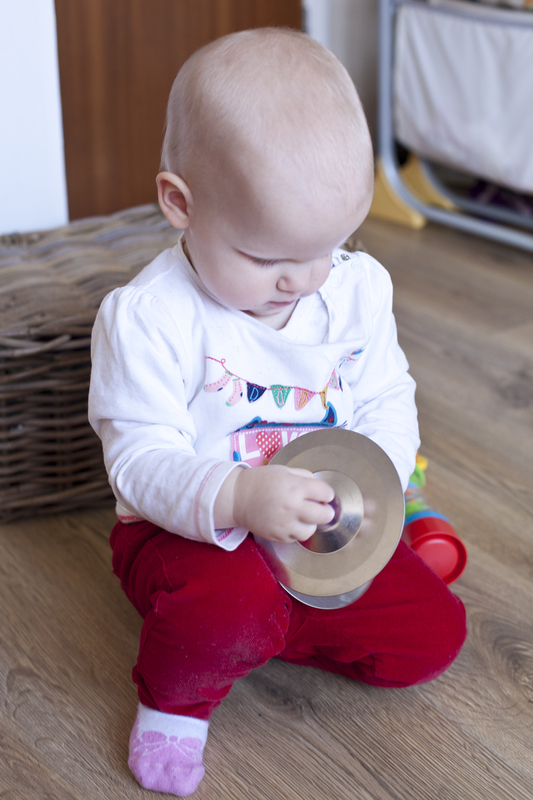 One of Lily's favourite things to do with things in the sensory basket is make noise. 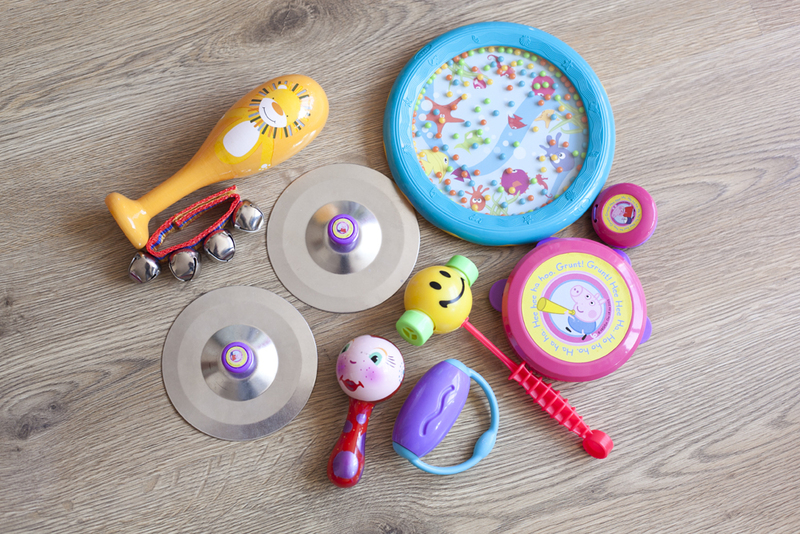 She loves the musical instruments and will often bang the drum we have with lots of the different items in the basket. 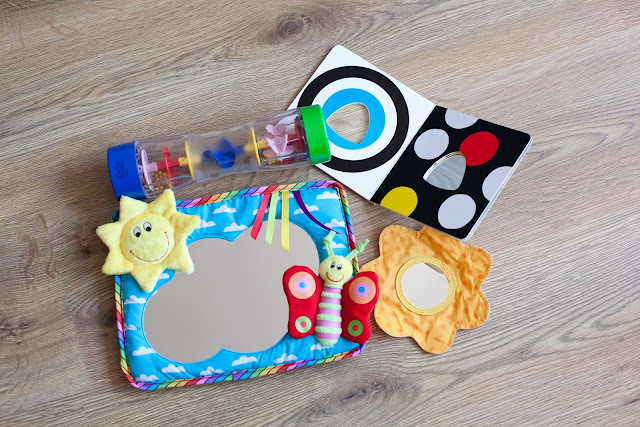 She also loves the Mirror that we have that is by Galt Toys who have a great range of items perfect for sensory boxes. She really like looking at herself in it and now will point to her nose while looking in the mirror. She also has given her self a few kisses while holding the mirror. Hence the lovely smear marks on it Haha. Not all items for the sensory basket have to be shop bought though. You can make things to put in yourself. 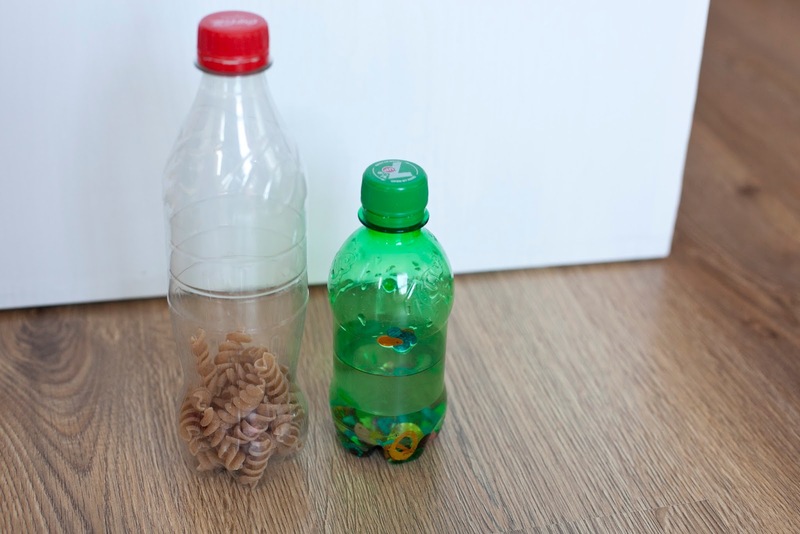 One idea is to make sensory bottles. Here are 2 examples of ones we have. One is filled with pasta and so makes a great rattle noise, and the other is filled with water and sequins which looks really nice and interesting and is also great to shake. 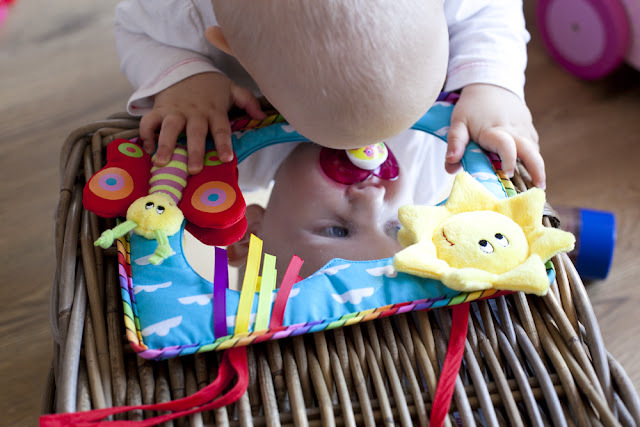 Lily Loves her sensory bottles and will often pull them out of the basket to play with. If you have never made a sensory basket for you child I really hope that I have encouraged you to want to make a one. But I must stress as a lot of the objects in the sensory basket are not toys, you must always make sure that your child is fully supervised when playing with them. I would love to know your thoughts on sensory play. Have you ever made a basket? What would you put in yours?